lespecial consists of Jon Grusauskas, Rory Dolan, and Luke Bemand. The trio is originally from Connecticut, but they are currently based in New York and Boston. Cheen, the band’s second album, was released this past October. The band is currently about a quarter of the way into their 2018 Spring Tour, which will take them throughout the United States. Doors to the show were at 8pm, and little by little, people trickled in leading up to lespecial taking the stage around 9:30. I can’t say how many people were there for them, or how many were there for ELM (the second band to play), but I can tell you that people were quickly captivated by lespecial’s performance and music. It’s hard not to be captivated by this fascinating blend of musical styles and genres. I have never experienced a band that does some of the things that lespecial does. One minute I am listening to EDM, the next minute I am listening to hip hop, then I am listening to metal. 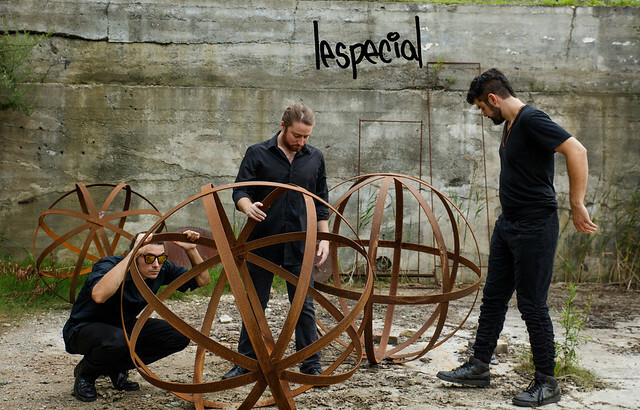 It is clear that lespecial draws influence from a number of different genres and many different bands. I really can’t say enough about how unique this music is. Think of early Incubus meets Primus with some EDM and hip hop sprinkled into the mix. For proof as to how lespecial changed their style dramatically from song to song, listen to their single “Sound That We Do,” featuring hip hop artist Zion I, for a dose of electronica and downtempo and then compare it to “American Apocalypse” for a blast of EDM-tinged metal on Bandcamp. The uniqueness of lespecial truly speaks to their creative ability. A lot of bands make “eclectic” music. There’s nothing wrong with that, but this music is so much more. The band has taken creativity and songwriting to a whole new level. Each song sounds different than the last. Each song is a journey that pulls you in and doesn’t let you go until the music stops. The various styles of music blend seamlessly together for a fresh sound that makes you want to keep listening. At one point, I found myself chuckling in amazement at what I was hearing. lespecial didn’t have a lot of stage antics. They don’t need them, their music does all the talking. By the end of the night, they had gained some new fans. They certainly gained one in me. The group is still in the beginning parts of their tour; they still have stops all throughout the country, and they will be coming back to the area in March. lespecial perform with Zion I in a show at Union Stage on March 17. Buy your tickets online! Check out some of their songs below and keep an eye out for them coming to an area near you.